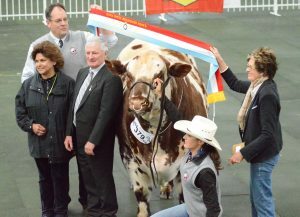 Exactly 100 years after the publication of the first volume of its Herd Book, and 98 years after the Society was founded, the Beef Shorthorn Society has elected a female president of its Federal Council for the first time. At the Annual General Meeting of the Council, held on 21 April, Marion Spencer was elected unopposed. Marion and husband David are the principals of Spencer Family Shorthorns of Yuroke and Rutherglen. Their interest in breeding shorthorn cattle stemmed from the long-time involvement of David’s father, Victor. As principal of Elanora Beef Shorthorns, Vic was a Life Member of the Society, a Federal President, Federal Treasurer and Councillor and a longstanding Victorian Committee member. Marion and David have a keen and passionate interest in the agricultural sector. David’s association with Beef Shorthorns was fostered at an early age. He served for a number of years as the Society’s Federal President. He is a long-time Councillor and Victorian Committee member. He also currently serves on the RASV Beef Cattle Committee. Marion’s interest and love for the breed evolved out of her marriage to David. Born in Malaysia and migrating to Australia as a child, her adult years were spent working at La Trobe University, and then in the corporate sector. Marion has been, and remains, a Victorian Committee member and Federal Councillor. For a number of years she was Federal Secretary of the Society, relinquishing that role in 2017. She has also been involved in the Stud Beef Victoria Handlers’ Camp, having served as a volunteer for 9 years. During the Royal Melbourne Show, Marion plays an active role in organising events on behalf of the Beef Cattle Committee. As will be well-known, Spencer Family Shorthorns have enjoyed great show-ring success at the Sydney, Melbourne and Adelaide Royal Shows. Spencer Family Beef and Australian Shorthorn bulls have been influential in other studs. The future of the stud is in good hands with son Luke and grand daughters Claudia, Nakita and Briana. The children have a proactive approach to preparing and exhibiting the cattle alongside their father and grandfather. Claudia now studies agriculture at Longerenong College.